South Florida is known for their soft-white sand beaches and cities built around partying. There’s the Florida Keys to the south and Lake Okeechobee in the north. However, to the far left is a large wetland known as the Everglades. Stretching over 800 square miles, it starts all the way up close to Orlando and leads all the way into the most southern part of the state of Florida. Despite growing smaller in size due to a number of factors, the Everglades still dominates the area. The ecosystem is home to hundreds of different flora and fauna species that live and thrive within the great wetlands. 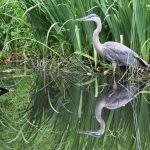 As one of the major wetlands of the planet and the largest designated wilderness in the eastern United States, this national park is incredibly important to preserve as it is the homes of so many species. Prairies of sawgrass and forests of Mangroves line the small waterways. As it is a wetland ecosystem, this area has very little room for walking due to the little amount of dryland available. 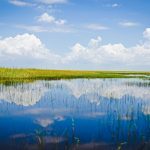 We highly suggest that everyone visits the Everglades at least once in their life to experience the untamed beauty and peacefulness that is the “River of Grass”. The Everglades has a rich history, dating back over 15,000 years ago when humans first arrived in the area. They most likely entered the area as they hunted prehistory creatures such as the giant sloth. As much of the ice melted and the climate began to change, the environment became much wetter and made it much easier to live and thrive in. Soon, the Everglades would begin to flourish as water flowed freely through the sawgrass and mangroves from near what would be modern-day Orlando all the way to the southernmost tip of South Florida. Settlers moving into the area would make great attempts to transform the majority of the wetlands into farmland. This greatly damaged the Everglades’ ecosystem, as large portions of the area were replaced with flattened earth for crops. Before this entire ecosystem was completely wiped away by land developers, heavy conservationist efforts have been made throughout the years to save the ecosystem. In 1947, the Everglades was officially classified as a national park in an effort to further protect the area against development. Today. it persists as one of the largest wetlands in the world. As the largest wilderness in the eastern United States, the Everglades has one of the most diverse ecosystems in the world. From its climate all the way down to the variety of animal species that call the area home, the Everglades has completely separated itself from all other wetland ecosystems. Temperatures typically average 65 to 85 degrees throughout the year, with cool ocean breezes flowing from the Gulf Of Mexico. The area is primarily made up of sawgrass marshes, mangrove forests, cypress swamps, and the Florida Bay. Thousands of native and invasive species have made the Everglades their home. 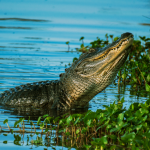 No species stands out as the face of the Everglades as the American alligator and Florida panther do. This ecosystem tends to be difficult to traverse as roughly 90% of the area is wetlands. Most boats can’t traverse the area due to the tight avenues and tight network of mangrove roots and sawgrass prairies. Thankfully, you have the opportunity to experience the Everglades yourself while onboard one of our Everglades tours. While onboard, our expert captains will answer any questions and direct you to any major landmarks found throughout the area. You’ll be up close and personal with one of the most incredible locations on the planet. While there are other companies that offer Everglades airboat tours, they typically do so on public tours on subpar airboats. With Fort Lauderdale Airboat Rides, you’ll experience a personal and private tour for one to two hours as we traverse the great fields of sawgrass. Our boats are brand new and always ready to go. If you’re interested in seeing the Everglades with Fort Lauderdale Airboat Rides, then call us today at +1 (954) 284-9130.